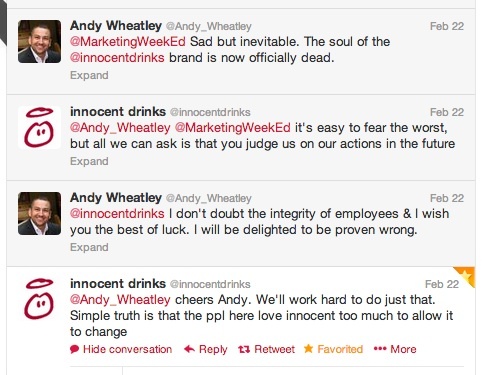 Coca Cola has now taken a 90%+ stake in Innocent Drinks. The cynic in me says that it’s game over for the brand’s authenticity, but could I be wrong? I hope so. I almost stopped buying Innocent drinks in 2009, when I first read that Coca Cola had taken a share in the brand. I was troubled by the contradiction presented by the opposing nature and personality of each company, no matter how either of them framed the deal. I felt disappointed and let down but, crucially, continued to purchase the brand, albeit with a little less frequency and enthusiasm than before. Now, the news that the stake has risen to over 90% presents a much bigger dilemma – the founders no longer have operational control. Yes, the brand will continue to be run by the company’s current management team but the fact is that they now report wholly into Atlanta. Our aim was to make Innocent a global brand and take its ethical values to the world’s consumers. We decided that we would be able to do a better job of that with Coke. And who’s to say that they won’t now go on to achieve even greater and more positive things with the personal fortunes they have amassed? Sometimes, you have to get in bed with the enemy to keep the good work going. I loved Innocent’s response. It told me that there was a lot of fighting spirit left and that, just possibly, the brand could continue to be a beacon of ethical and sustainable behaviour. But it also illustrates the challenge facing Innocent employees. What do you do when the company you work for, that you joined because of its ethics, throws you in with one of the biggest and most financially motivated companies in the world? It’s clear that the spirit of the brand continues to live on in its staff, and one can only hope that their values and principles can continue to make a positive and ethical impact on the world from within the red walls of the corporate machine that is Coca Cola. I wish them all the luck and goodwill in the world.